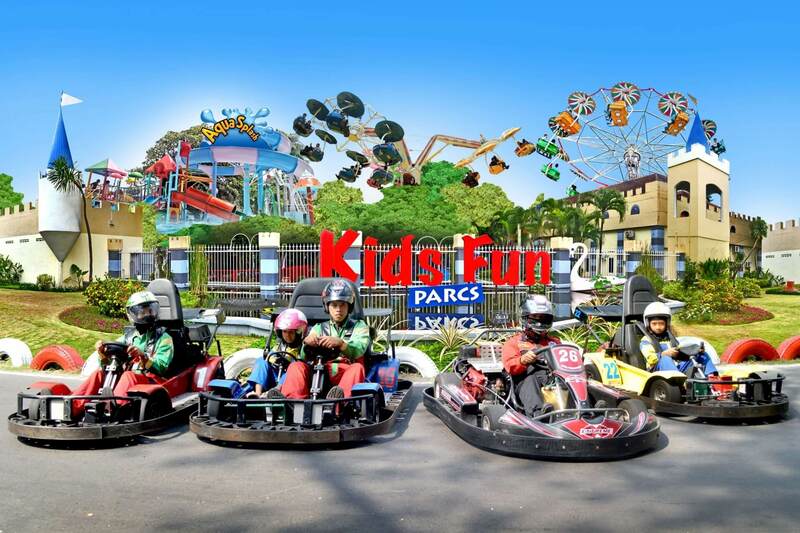 KIDS FUN YOGYAKARTA comes with 23 rides for kids and 12 rides for adults. Feel the thrill of rafting, water bikes, riding a Harley Davidson and a bumper car and many more. Besides being attractive, you also do not need to worry because all of these rides also completed with good standard security so it is safe for kids and families. There are 23 rides for children. Each has its own uniqueness and excitement. Also of course the rides that it meets safety standards and also can enhance the creativity and courage son - or daughter. There are 12 rides that can be enjoyed with your family, for both children and adults. These rides can certainly increase happiness, togetherness and solidarity of your family. Ever felt fly like Batman or Superman? want to feel the thrill of trying to climb the walls like Spiderman? You can feel it in the Kids Fun Yogyakarta. KIDS FUN YOGYAKARTA AQUASPLASH is a swimming pool with giant umbrella, equipped with a 7.5-meter-high slides, current pools, spilled buckets and many other pools. Various restaurants with a varied menu of meals, drinks and snacks from different countries, found a blend of culinary pleasure with fun kids rides. Kids over the age of 2 years or more than 85 cm high already imposed ticket. Aqua Splash swim in the pool must wear clothing. By purchasing a Kids Fun ticket, you and your family can enjoy 23 rides for free, with 22 of them to do as much and many - times with the provisions should be queued back, while the jurasic park is only 1 x free. Kids Fun Yogyakarta also has a variety of shows including Pirate operetta , Costume Characters and Various creations.